As a product manager, you’re often tasked with making a feature-request happen with little direction, constrained resources, and an ever-growing product backlog. My goal is to make life easier for you. Referral programs are essential for many high-growth products, and guess who gets to build them? That’s right: product managers like you. A quick search of “referral programs” surfaces a host of issues to consider. Who gets the referral reward? What does the referral email say? Who does it come from – the individual referrer or the company itself? 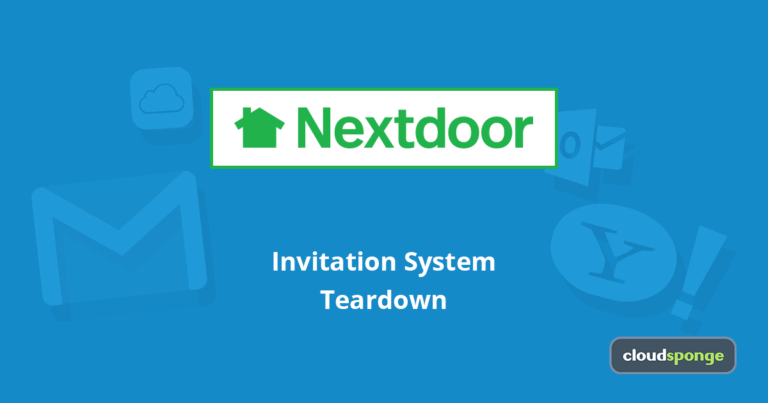 How is attribution handled when multiple referral invitations are sent? Above all, how does each referral program stand out and how can it be improved? For this reason, I am tearing down well-known referral programs for you. I’ll break out the specific choices that each program has made providing you with no-nonsense information to streamline your implementation process. I’ll highlight best practices throughout. You won’t have to review every referral program yourself; I’ve already done it for you. 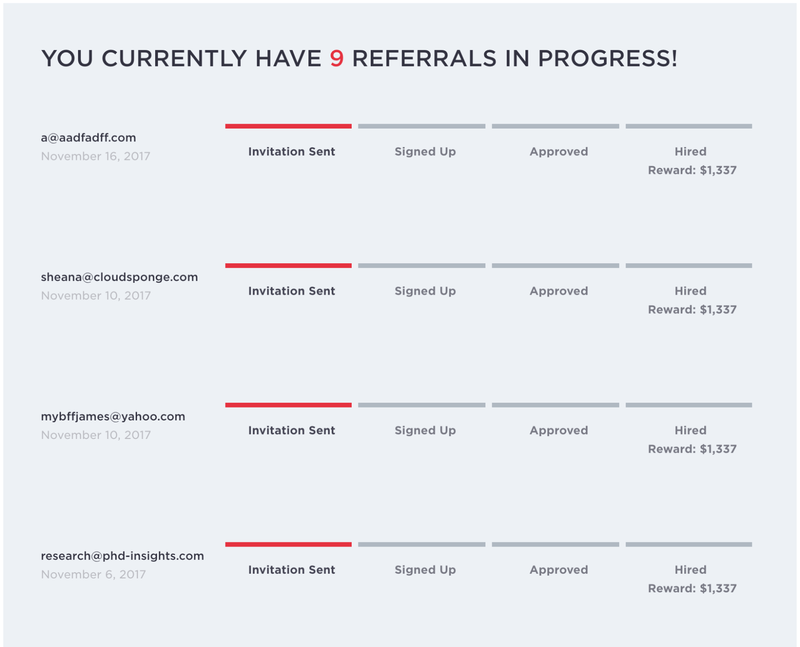 To kick it off, let’s take a look how talent-juggernaut Hired has structured their referral program. 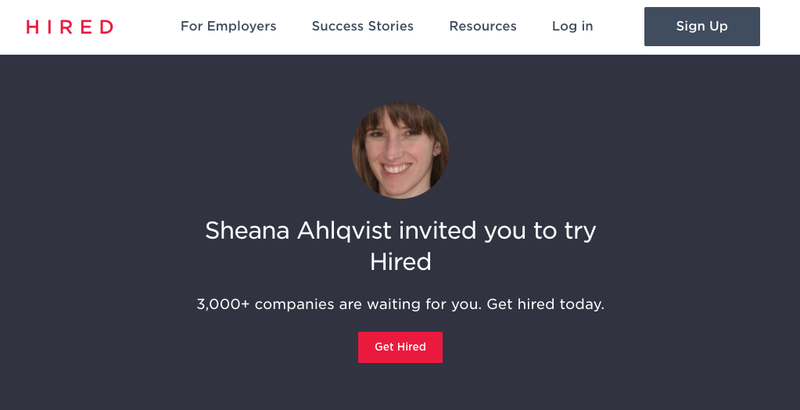 Hired is a talent-matching platform that flips the traditional job placement model. Rather than talent sorting through countless job openings to see which ones might be a good fit, companies view profiles of pre-screened talent looking for new career opportunities. Companies then have to bid on the talent they want to recruit, resulting in a competitive salary for the new hire. Hired offers referral programs for both sides of the marketplace: referrals for companies to find talent and referrals for talent to find opportunities. Below, I focus on Hired’s talent referral system. With elite talent being, by definition, pretty rare, a strong referral program is essential for Hired to continue identifying top talent. Hired carefully screens its talent pool. Since Hired wasn’t interested in me as a possible job candidate at the time of this teardown, I was waitlisted. How could waitlisted talent help grow Hired’s marketplace? Give them referrals. As soon as I enter the Hired website, a strong call to action is presented. It’s crisp, clean, and concise: “Get your friend a job. Get $1,337.” The tagline beneath it offers additional details: “Invite friends to the Hired Marketplace, and we’ll send you $1,337 when they accept an offer.” Boom. Sounds easy enough. Hired does a lot right, immediately. The call to action is succinct and effective. It tells me what I need to do (“Invite friends to the Hired Marketplace”), who I should invite (“friends”), and why (“we’ll send you $1,337”). To top it off, it’s clear when I get that money (“when they accept an offer”). How can you invite someone to Hired? 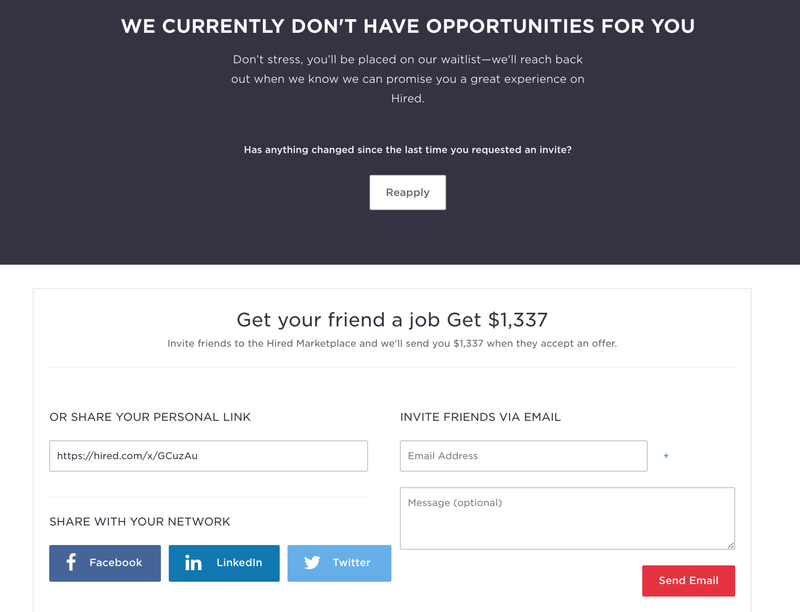 Hired lets you refer a friend just about every which way. They offer easy sharing buttons for Facebook, LinkedIn, and Twitter, each of which pulls a social-optimized photo and includes your referral link. The Twitter-share feature goes one step further by including appropriate hashtags and tagging Hired on Twitter. These details count when sharing on social. They also let you share via a personal referral link and let you invite friends via email. Although I immediately saw the strong call to action mentioned above, I later discovered that Hired has another referral page at hired.com/invite (i.e., the standard referral page). This page is different from the page I was presented when I first logged in (i.e., the waitlisted referral page). There are some differences between these two pages, including how email referrals are sent. You can add email addresses manually or import your contacts via the “Find Gmail Contacts” button. I’m assuming this is their most successful referral avenue, as it’s prominently featured. When I click on that button, the CloudSponge widget takes me through the Gmail authentication process and I’m presented with my Google Contacts, very nice. If I discontinue the authentication process, I can access a longer list of address book providers including Gmail, Yahoo, Outlook, iCloud, and AOL. It even teaches you how to import your contacts from LinkedIn (very cool!). Given their need to attract qualified professionals, LinkedIn is a great option for Hired’s talent to refer other stellar talent. So what should a loyal user tell their friend about Hired? Here, talent can easily refer a friend without having to manually write a message. This makes the process more streamlined. However, Hired does not show any details on what will be sent. Once that “Send Email” button is clicked, a mystery message is on its way to your friend. Someone who carefully protects their social capital might be reluctant to send a referral email when they don’t know what it says. Waitlisted talent can also send referrals via email immediately upon logging in to Hired.com. Unfortunately, emails must be entered manually as there is no option to import contacts. We also see that here referrers are given the option of adding a message. Referral programs often allow users to include a custom message in order to further leverage the relationship with the referred person. Hired makes a smart choice by letting the message be optional. Although a personal message may help the referred friend convert, it also requires additional work for the referrer. Making it optional gives Hired the best of both worlds: handcrafted referrals when possible, but low friction when a referrer is in a rush. Where Hired’s referral program really shines is in onboarding the referred friend. First, let’s look at the basics. The email is sent from Hired and successfully routed to my inbox. It includes a stellar subject line: “Sheana recommended you for Hired!” Let’s review the key components that make this a winning subject line. In a totally awesome move, the first thing I see when I open the email is a large picture of the friend who referred me. Immediately, I understand that this is a personal referral, sent to me by someone I know. We also see the message that the referrer added here, and Hired once again calls out their name. The copy in the email itself is great: short, sweet, and effective. They tell the referred friend what Hired does (a talent-matching platform) and who it’s for (people in engineering, product management, data science, and design). They break down “how it works” into three easy-to-read steps and include an unsubscribe link. (I would like to know more about this “signing bonus” they mention in the last step. How much, exactly?). This email was made with the busy professional in mind. Bravo, Hired. With one click on the “Accept your invitation” button, I’m whisked away to Hired’s onboarding flow. Right away, I see the name and photo of the person who referred me. This carries the social proof directly through to their website. They again include a clear call to action – “Get Hired” – making it easy for the referred friend to get started. Moreover, they include a “Here’s how it works” section for those who want to know a little more about Hired’s program. 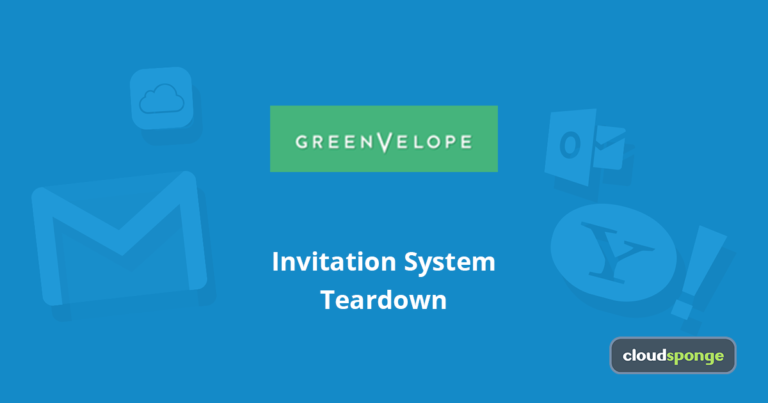 Although the email invitation briefly mentioned how to get started, this is where the details are really broken out. Hired tells you what to expect: create an amazing profile to feature your experience and portfolio. Of course, it will be private from your current employer. They explain the process: companies will view your profile and invite you to specific jobs. They showcase what makes Hired unique: a streamlined interview process with amazing success; 75% of talent accept a job offer they receive on Hired! Surprisingly, there is still no mention of the “signing bonus” referenced in the referral email. All in all, Hired does an outstanding job of motivating me to sign up by showcasing the person who referred me, making the referral sound prestigious, and presenting the benefits of Hired in a clear, concise way. So when do I get my $1,337 for inviting a friend to Hired? It’s easy to find out because Hired has complete referral-tracking functionality. When I go back to the Standard Referral Page and scroll down, I can see the status of my past referrals. Hired excels here. They list how many referrals I have in progress. I can see who I referred and when. I can see each of the stages in the referral funnel, from when the invitation was sent to when they are hired. I can see exactly where each of my referred friends is in the process. I can also see the promotional rewards I was promised. Last but not least, I see that one friend I tried to refer had already been invited by someone else. Now I don’t need to wonder if I’m going to receive a reward for that invitation. And there you have it: a complete look at Hired’s talent referral program from end to end. Let’s review some of the highlights. Given that there are so many decisions to make about a referral program, there are several pieces of Hired’s referral program that set the gold standard. Two components really stand out. First, Hired is absolutely killing it when it comes to leveraging the personal connection between the referrer and the referred friend. Referral programs work because word-of-mouth marketing works; we trust our friends and value their recommendations. For this reason, excellent referral programs emphasize this connection whenever possible. Hired does this better than just about anyone I’ve seen. Before you even open the Hired invitation in your inbox, the subject line begins with the referrer’s name. This communicates that the email is coming from a friend (although the “from” email address does actually belong to Hired). What really wowed me though was what I saw when I opened the email: a full profile photo of the person who invited me to Hired. Seeing a face immediately commands our attention and influences our feelings. In text-heavy contexts like web browsing, human faces have a huge pull on our attention. 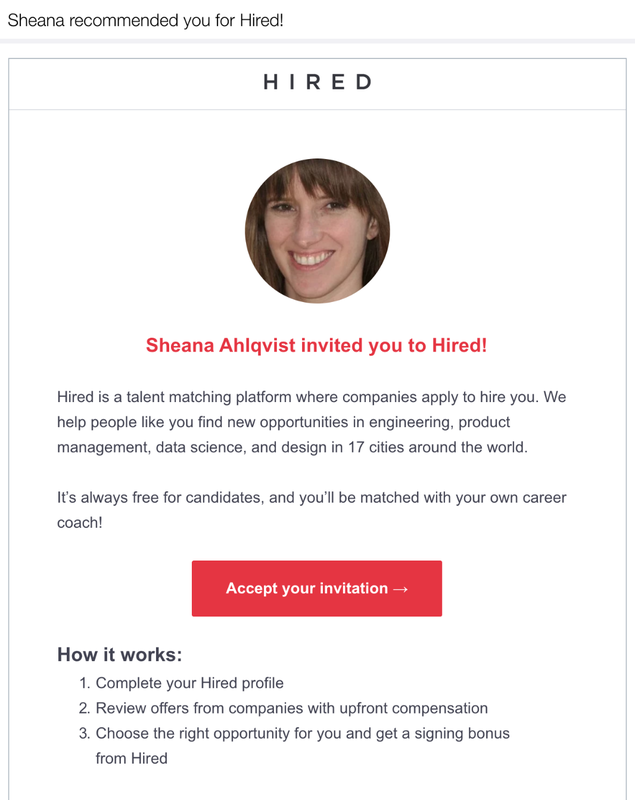 In Hired’s email invitation, a friendly face is front and center. It builds trust and conveys social proof. It’s not just any face; I know that face! But this personal referral doesn’t end with the email invitation. When I click “Accept Your Invitation,” I am whisked away to the Hired website, where I can begin the onboarding process. Hired has gone one step further by carrying that referral photo onto the landing page: when I begin onboarding, I see the friendly face of my referrer once again. Now that personal connection has left my inbox and made me feel warm feelings right on Hired’s website. Three cheers, Hired. A second place that Hired stands out is their referral-tracking system. Hired makes it super easy to track your referrals. As detailed earlier, Hired shows me just about everything I could want to know about my past referrals: to whom I’ve sent invitations, when I sent them, what reward I was promised, etc. It’s displayed in a concise and elegant way. I love that they show the breakdown of the onboarding process, so I can see whether someone has signed up or was ultimately hired. And because they are offering cold, hard cash, I want this level of detail. I want to know who accepted my invitation and when I’m getting my $1,337. Incentives should always “fit” your customers and your business. Hired nails it. Since their goal is to attract high-quality job candidates, they are smart to offer a high-value reward that will appeal to the successful professional. This is no free pizza. It’s cold, hard cash. On another note, $1,337 is an awfully specific reward! This is a nod to Hired’s early days as a fledgling start-up. Unbeknownst to me until today (and the reason it sounds like your grandmother wrote these next few sentences), 1337 is a special number used in hacker circles to indicate “elite.” In Hired’s early days, they focused specifically on recruiting coders and software engineers, making this referral reward oh-so-perfect for their target audience. On top of this great wink-and-nod to coders, using an extremely specific number is a good strategy for the rest of us non-coders. Pricing and negotiation gurus know that using a highly specific number in a negotiation works to your advantage. This is because it legitimizes the amount and makes it seem like they are giving you as much as they possibly can. As a consequence, I’m convinced they’re giving me as generous a cut as possible, whether that’s the case or not. I originally assumed that $1,337 was based on the precise value Hired computed for having an employee successfully on-board. Thus, this amount is effective for both coders and non-coders. As with anything, there are a few tweaks Hired could make to further strengthen their referral program. 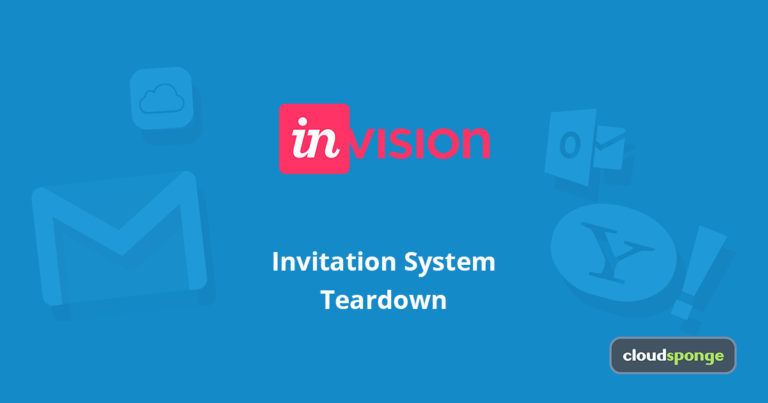 There are a few components they should add to their email invitation process. Obviously, this process should be identical on both the standard referral page and the waitlisted referral page. First, when sending a referral invitation via email, the referrer should be able to see what message is being sent. Someone who carefully protects their social capital might be reluctant to send a referral email when they don’t know what it says. Hired can improve the user experience here by showing what message will be sent. Second, Hired should emphasize earlier exactly who is the ideal referral target. As discussed above, the main headline was “Get your friend a job.” Any friend? Any kind of job? Not so much. Obviously, you can’t squeeze details into this catchy tagline, but additional guidance could be offered earlier. They list these details at the veeeery end of the main invitation page, where they explain why you should recommend Hired and who you should invite. This is an especially striking oversight given that Hired differentiates itself by pre-screening talent, accepting only 5-8% of applicants. Presumably, they would be interested in the best referrals, not just the most referrals. Lastly, a few final details work well but could be punched up. On the main invitation page, the CTA invites me to “Find Gmail Contacts.” But the CloudSponge widget is capable of importing contacts from much more than just Gmail. If I had been your typical Outlook.com user, I might not have clicked on this button at all. Changing this label to a more accurate “Import My Contacts” or displaying more links than just Gmail on this page may encourage more sharing. I’d also like to see a stronger confirmation message after I send an email invitation. As it currently stands – a tiny grey bar at the very top of the screen – it’s easy to miss. This should be a tiny celebration! Let’s make the Hired referrer feel great about their choice to share with a friend. 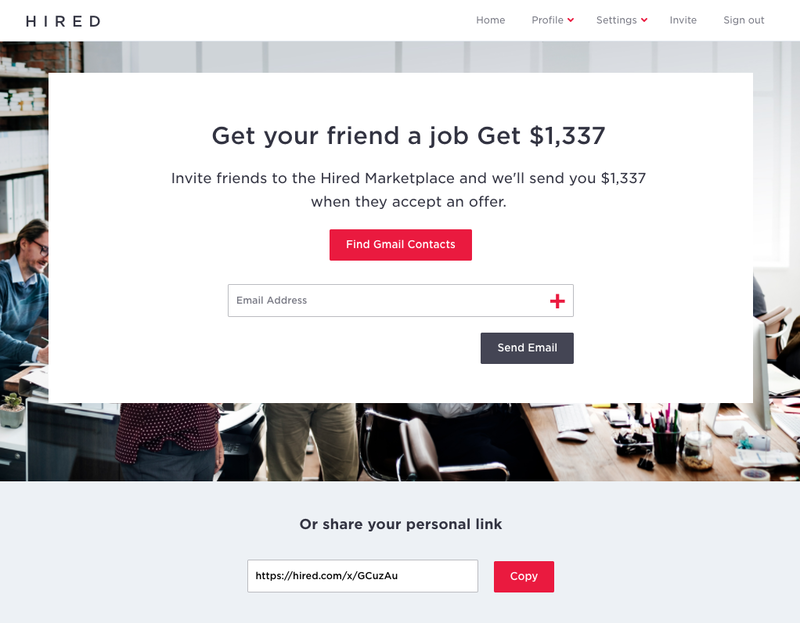 Hired currently offers a one-sided referral reward when a referred friend accepts a job through Hired. The person who made that introduction gets cold, hard cash. I’ve also included a feature matrix that details other elements of their referral program. I’m excited to see how Hired innovates in the coming years (did you see that they released awesome features to make more data-driven hiring decisions?) and speculate that the personal touch they bring through their referral program will play a meaningful part in that growth. Was this teardown helpful? Let us know in the comments below. Keep an eye out for my next teardown in the coming weeks! Sheana Ahlqvist, User Researcher and host of the Innovation For All podcast, which discusses the interactions between society and technology.